Welcome to this Treasure Lake picture and information site which takes you inside Treasure Lake to enjoy the kaleidoscope of scenery and activity in this unique, private community. 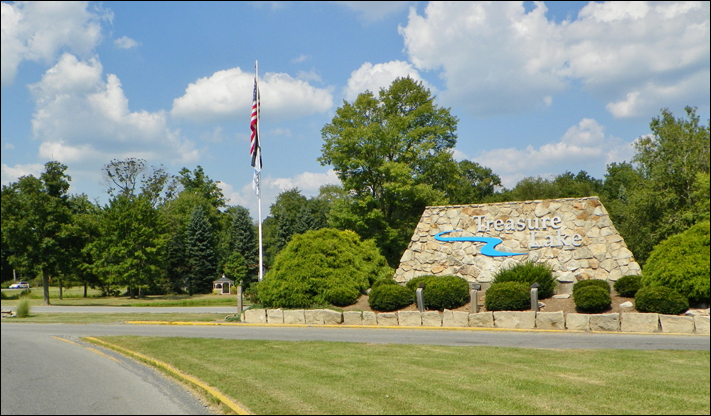 Treasure Lake is comprised of approximately 2000 homes located in a 9000 acre wooded setting. Those who live in Treasure Lake enjoy pleasant residential and vacation living conditions. Amenities include lakes, a marina, boat docks, beaches, swimming pools, two PGA rated golf courses with pro shops, tennis courts, basketball and volleyball courts, restaurants, sports fields, nature trails, walking paths, and playgrounds. In a separate section of Treasure lake is Cayman Landing Campground with amenities that include cabins, campsites, a pool, miniature golf, a playground and basketball court, a recreation clubhouse and an ice cream shack with a camp store. The public is welcome to golf, dine and camp at Treasure Lake. The PGA rated Gold and Silver golf courses are open to the public. Lakeview Lodge and the Ski Lodge also welcome the public for dining, and Cayman Landing Campground has cabins and campsites for rent that are open to the public. Copyright 2013 - TreasureLakeInfoPics.com - All Rights Reserved.